ANNIE - Official Trailer - In Theaters Christmas 2014! 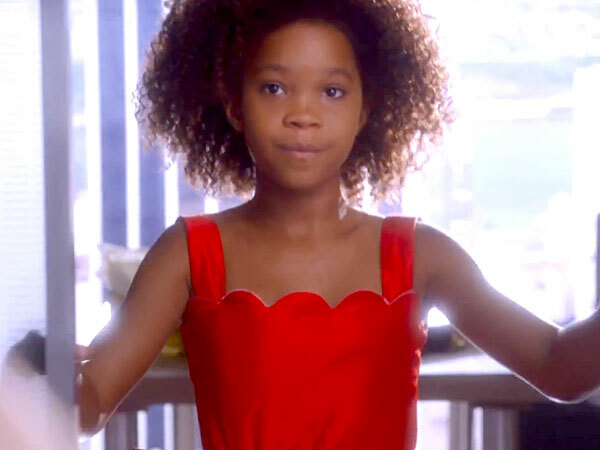 Bet your bottom dollar you can't resist Quvenzhané Wallis in this first trailer for Annie. The 10-year-old actress, an Oscar nominee in 2012 for Beasts of the Southern Wild, is ebullient as the young girl plucked from an orphanage by a wealthy politician, played by Jamie Foxx – much to the dismay of the cruel orphanage owner Miss Hannigan, played by Cameron Diaz. This is the second film adaptation of the 1970s Broadway musical, which was in turn based on a 1920s comic strip. But it's been totally updated, from the glitteringly modern New York City skyline to the sly Facebook reference at the end of the trailer. The movie hits theaters at Christmas. Last edited by dougie; March 6th, 2014 at 10:00 PM. No and WHY?? How much of my childhood are you going to screw with??? msdeb and Belt Up like this. Jamie Foxx playing Daddy Warbucks gives me the creeps. I have a feeling of dread with every new children's movie. I sometimes consider cancelling our cable and playing only CDs in the car so the kids never hear about them. I didn't like Annie the first time, now this? At least my lowered expectations leave room to be surprised. That's probably better than a remake of something I enjoyed. Walking into the theatre for the new Karate Kid, I already knew how fucked I was. I was obsessed with Annie as a little girl. I knew all the songs, and my parents had the record of the Broadway soundtrack, featuring Andrea McArdle as Annie. I watched the movie over and over again. The trailer for this was so disappointing. I hate how they've done it in a present day setting, with the characters throwing out sassy jokes about Facebook and George Clooney. No. Just... No. I feel like "Annie" is one of those stories that doesn't really translate to present day. It doesn't work in a modern setting. The whole point of the story was the contrast of growing up in an orphanage with the mystery and glamour of Old Hollywood and the political elite. Neither of those things really exist anymore (U.S. orphanages, mystery regarding public figures). I'm thinking of the soundtrack right now and how basically none of the songs will make sense in a modern-day setting. I would have preferred that they do something more in the vein of a modern day sequel inspired by the original than a remake that completely butchers the story. Do a movie about a girl growing up in foster care who somehow ends up being placed with the girlfriend of a wealthy politican (inspired by Grace and Daddy Warbucks). Write a new story and, if you want a musical, new songs.... ones that actually work in the context of the setting.